So far in this series, about half of the books I’ve discussed have been nonfiction and the other half fiction. This is the first time I’ve written about a text on critical theory—and it may be the best lit crit book I’ve ever encountered. The text I’m speaking of is Scott McCloud’s Understanding Comics: The Invisible Art. Published in 1993, the book remains the definitive work on comics theory a quarter century later. Others have attacked the subject, but none come close to McCloud’s exhaustive treatment. McCloud is an unlikely “Aristotle of comics.” Prior to Understanding Comics he was best-known for Zot!, a lighthearted superhero comic book series which introduced many American readers to the tropes and style of Japanese manga. While Zot! was a success in the 1980s, its reputation has not swollen over time, as evidenced by McCloud’s sheepish preface to a 2008 reprint. There’s nothing sheepish to be found in Understanding Comics—McCloud is not merely comic’s Aristotle, he’s one of its best ambassadors. His belief in comics’ power and universality is unshakeable. Page after page he convincingly argues comics belong in the same inner circle as other high art forms, including art considered vulgar upon its first appearance, such as film and jazz. Comics may even be more inclusive than other forms, as the language of comics is the language of the modern world. Advertising, software, religion, news, and entertainment all employ comics’ visual cues for their own purposes. This isn’t so much a book on comics as a book on perception and semiotics. McCloud’s treatise left me with a renewed pleasure for reading comics. He disassembled and reassembled what I “knew” about comics before my eyes, all the while with concision, humor, and infectious zeal. His unraveling of the “invisible art” also left me with a fresh re-looking of the world at large. I can’t think of higher praise for McCloud’s magnum opus. Understanding Comics is not the first work on the principles of comics. That honor goes to Will Eisner’s Comics & Sequential Art. Before Eisner, books on comics focused on technical production: inks, scripting, musculature, shading, etc. (The most prominent example I know of is How to Draw Comics the Marvel Way, the standard go-to guide for aspiring fourteen year-olds back in the day.) Comics & Sequential Art focused on the language of comics, much as a book on film theory would discuss camera angles and shot selection as the “language” of movies. Prior to Eisner and McCloud, books on writing comics skewed toward technique and process. Sequential Art‘s biggest contribution is right there in its title—Eisner put forward a general definition for comics. 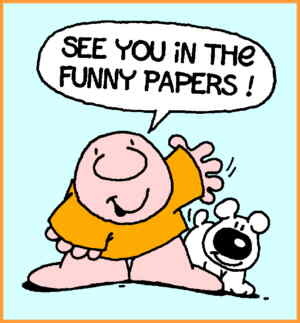 He held up comics as a special style of communication with unique properties and advantages. Eisner saw the field still struggling to break free of cultural restrictions (“comic books are for kids”) and waiting to be applied to broader purposes. For example, Eisner advocated using comics for technical manuals and in education. Reading comic books in grade school may be more acceptable today than when I was young, but I suspect the suggestion still earns chuckles among certain educators. That’s too bad; Eisner remains ahead of his time. After all, while IKEA’s assembly guides and their Ziggyesque “IKEA Man” character have elicited much lampooning, their ability to transcend written language stems from the fact that they are comics. And when Google wanted to introduce the world to its new Chrome browser in 2008, it hired none other than Scott McCloud to present the software’s design and features via a digital comic book. Understanding Comics takes many cues from Eisner’s work, and McCloud is eager to tip his hat to the master as well as introduce readers to a plethora of other comic artists you may or may not have heard of. But where Eisner’s book is head’s-down on the drawing easel, McCloud’s eyes are fervently skyward. Eisner’s intended audience is other comic artists; McCloud’s audience is everyone. To McCloud’s thinking, the language of comics permeates the modern world. He’s not merely comics’ Aristotle and ambassador, he’s its evangelist. Understanding Comics may be the first foundational lit crit text written by a fan boy. The care and thought put into Understanding Comics is evident from the front matter onward. Consider that a book subtitled “The Invisible Art” opens with an enlarged image of an eye staring back at the reader—an iris, eyelashes, and eyebrow framed by a comic panel. Seeing is everything for McCloud, which is why Understanding Comics earns a space on the shelf beside Berger’s Ways of Seeing. McCloud dogfooded comics. His entire thesis, from first page to last, is told in comic form. He demonstrates the ubiquitousness and power of comics by drawing comics. The only places McCloud “reverts” to pure text are the Acknowledgments and Bibliography pages (where he can be forgiven, since I doubt anyone wants to read a Bibliography set to comic form). Cleverly, McCloud inserts a cartoon representative of himself into the book to gently guide the reader along (and even analyzes the strategy itself as a graphic device). He deploys every trick in the comic biz to illustrate his points: alternate panel layouts, strange word balloon shapes, odd and abstract art styles, and so on. Every page offers a surprise for the reader. I can’t imagine the quarts of blood McCloud must have sweat to craft this masterpiece. Whatever criticism you may lob at McCloud, you can’t call his book dry. After an ambitious and vivid history of comics going back to prehistory (no, really), McCloud appropriates Eisner’s term for comics—”sequential art”—and develops his own rigorous definition. From this foundation he launches into the depth and breadth of the language of comics: panels, gutters, lines, word balloons, transitions, and the utility of color (as opposed to the job of coloring, a la How to Draw Comics the Marvel Way). McCloud’s ambitious “picture plane,” from photo-realism (left) to iconography (right) with the degree of abstraction rising up the pyramid. The eye on the left is the realm of visual and the mind on the right is the realm of ideas. Notice on the far right how McCloud considers written language a kind of “pure” iconography. But McCloud isn’t satisfied to stay grounded on matters pertaining to comics itself. He reaches further with chapters on iconography, the nature of vision, and perception versus self-perception. He muses on the unique language of comics, where pictographs plus written word combine, and how space on the page can represent shifts in location and time, and sometimes shifting both simultaneously. He concludes with a surprisingly moving chapter on the relationship between artist and art that should be required reading for students of all creative disciplines. Whether you agree or disagree with his conclusions, McCloud’s faculties for persuasion are appealing and impressive. The power of Understanding Comics is in taking McCloud’s tour through language and imagery, even if you don’t always agree with his destinations. City of Glass, Paul Karasik & David Mazzucchelli: Engrossing graphic novel adaptation of Paul Auster’s novel. City of Glass reads like a pure application of Understanding Comics. Onward Towards Our Noble Deaths, Shigeru Mizuki: Mizuki’s semi-autobiographical World War II manga features a “cartoony” military against a backdrop of stark photo-realistic Pacific island landscapes, a visual strategy McCloud fleshes out in his book. Shenzhen: A Travelogue from China, Guy Delisle: A story of palpable solitude, Shenzhen spends much page real estate showing off modern China via “aspect-to-aspect” transitions discussed by McCloud. Asterios Polyp, David Mazzucchelli: Like Zen & the Art of Motorcycle Maintenance, Polyp is a personal tale about a man hitting the road intertwined with philosophical musings on nature and existence. As with City of Glass, Polyp is obsessed with structure, symbols, and synthesis. Mazzucchelli’s detailed visuals slyly make the abstractions concrete. Published 28 December 2017 by Jim Nelson. Last edited 10 February 2018 .